Today is the 128th birthday of Agatha Christie. At one time, I had this grand idea that I was going to read every one of her books in order of publication. That is a lot of reading. I didn’t get very far, but it was not her fault, I fall in and out of love with reading. There are points in my life where reading is much easier, if I have a commute or something. I love all the Agatha Christie movies, Miss Marple and even the Tommy and Tuppence ones, but especially Hercule Poirot (David Suchet portrayal). The books are quick and clever and keep you guessing. The world is a better place that she was in it and still feels the loss that she has left. 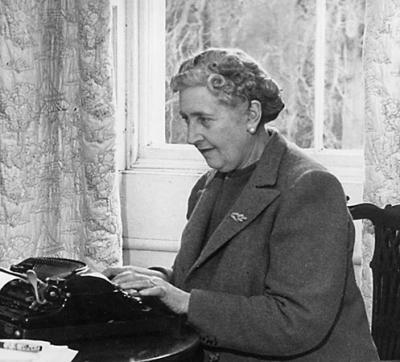 BEST KNOWN FOR: Dame Agatha Christie is the bestselling mystery author of all time. Her characters, Miss Marple and Hercule Poirot, have been repeatedly portrayed on film. Miss Marple has to be my favourite. I have the complete tv sets, takes me back to the 1950s when I was growing up, such a lovely time here in England, people so nice and polite and always dressed well. The stories are still brilliant to read and watch on tv. Poirot well every one adores him, when my younger Son years ago gave me the CD set of Poirot he said “I know how much you love Pot Rot” and the name has always stuck.